I have collected the most common questions I receive about ordering an Art Deco inspired Ketubah. Please write or call if you have any additional questions. How long before our wedding should we order? – 8 to 12 weeks. This includes time to submit information, review proof of ketubah. The exact timing will depend on when I receive payment, information and final approval. Rush Orders – What if our wedding is less than 6 weeks away? A 20% charge will be added to your total order. 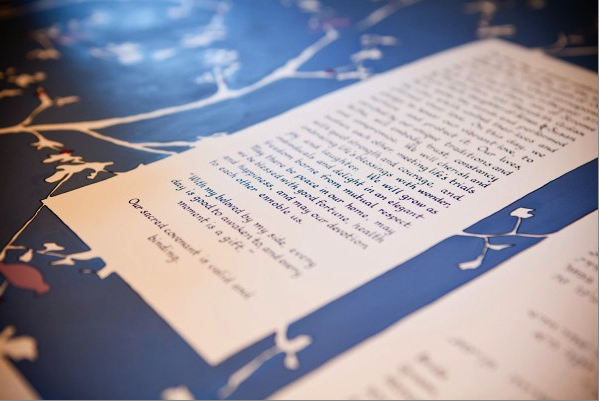 What information do we need to personalize our ketubah? I need everything on the order form submitted via email or fax. Do you take orders outside the United States? Absolutely. I’ve sent ketubah to the Turks and Caicos and the Italian Alps. Additional shipping fees apply and I need at least 10 weeks to ensure it arrives in time for your wedding in case of customs delay. Shipping – How is it shipped? Shipped flat between two pieces of foam and padded inside a box. You can use the packaging to display your ketubah and keep it flat and safe during the ceremony. All shipping via FedEx. Someone will need to sign for the package. Payment Options. By check, please. Paypal for international customers. Why buy directly from the artist? I do everything. You deal directly with me – no middle man. I do all the artwork and calligraphy. Each order is created by hand and meant to last centuries. Can we write our own text? Absolutely! Just provide me with your text exactly as you want it to appear and signed off on by your rabbi/officiant. Do you need the names of our witness? No. Typically people have two people and their officiant. Do you do custom designs? Absolutely! Sometimes colors look different on varying computer monitors, can I see the colors in real life? Absolutely. If you would like to see colors of your palette in person I would be happy to send a swatch of paint, snail mail. How should we handle our ketubah? Carefully! Your ketubah will be shipped in plastic. My suggestion is to keep it in the sleeve as much as possible and try to keep fingerprints to a minimum. What type of pen should be used? All orders include a pen, but in case you lose yours try to find a Micron 08 or a comparable archival pen. Available at any art or stationery store. How should we frame it? – Use acid-free, non-buffered, archival quality matte and UV protected glass. Hang away from direct sunlight. Fine Print: Once approved sale is final. Changes can be made but you will need to pay the price of a replacement.